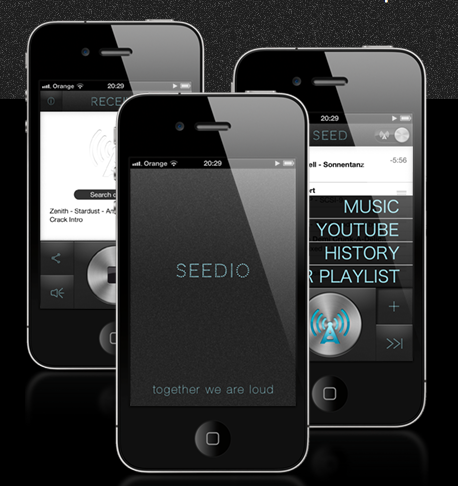 Check out the Seedio app for yourself . Go get the app for your iPhone. 2. Silent Disco: Plug in headphones into each iPhone and now you automagically have Silent Disco equipment. Everyone can be dancing to the same song. The visual design and user experience is really nice. I like the color scheme, and the simplicity of the layout (Giant play/ pause/ stream button is a good touch). My favorite feature is that the app allows users to get SoundCloud integration for $.99 via in-app purchase. The upgrade flow is really simple and easy, and works as advertised. You can search soundcloud for your favorite artists or mixes, and add them to your Seedio playlist. One issue was that we couldnt get more than 2 iPhones to sync up easily. We gave up after 3 minutes of trying. Maybe we were doing something wrong ? Maybe it only works with 2 Phones ? In order to really pull off the silent disco it would need to be able to support dozens and dozens of devices in a lare Mobile Ad Hoc Network. My point is that Seedio is really awesome now, but it has room for really pushing the envelope in Wi-Fi mobile ad hoc networking. Features Of Gamecih For Android Steps To Install GameCIH APK.